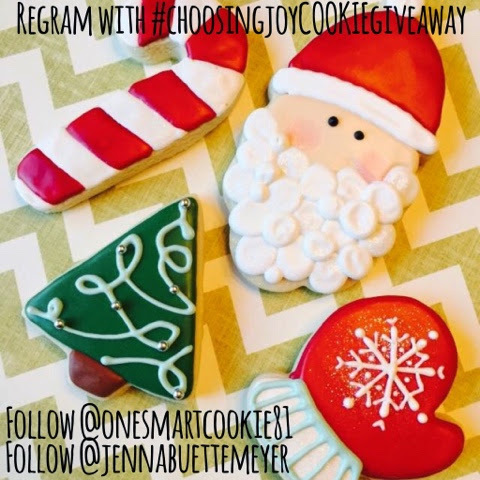 Choosing Joy: Black Friday Week of Giveaways-- Day 3- onesmARTcookie! Black Friday Week of Giveaways-- Day 3- onesmARTcookie! This is an especially delicious giveaway- and only open to local readers (Bella Vista to Fayetteville to meet for pick-up). My friend Tessa, a former art teacher, has been making the most amazing decorated cookies and wants to share a Christmas set with one of my readers! Are these cookies not AMAZING??????? I wouldn't even want to eat them because they are so pretty! But I have had some of Tessa's cookies before and they do taste as good as they look! Yum! Head over to Tessa's Instagram and check out her designs. She'll be posting several options between now and Christmas and the winner wins one set of a dozen cookies ($20 value) of their choice to be delivered before Christmas! Follow her and enter through the Rafflecopter below! You can also contact Tessa for custom orders by emailing her here. Also don't forget to check out the YoungLiving giveaway and the Jamberry giveaway!